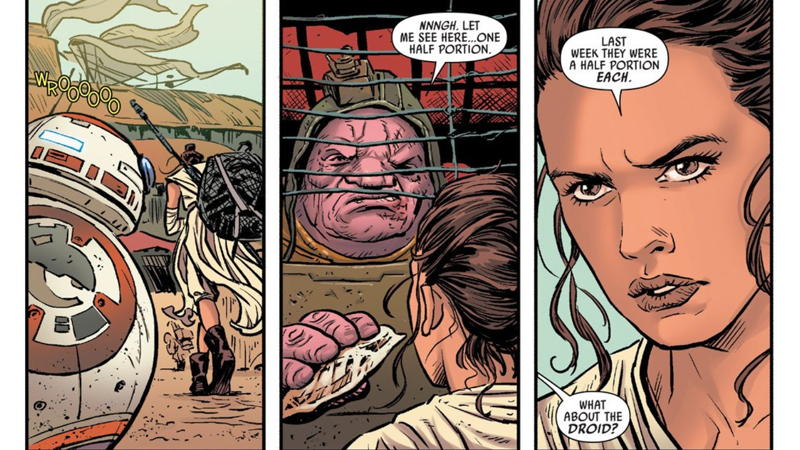 Marvel recently released the first issue of its The Force Awakens comic adaptation, and it is weird. It is weird in 2016 to see a straight adaptation of a movie in comic form, months after the movie came out. But it’s part of tradition for the company, one that stretches all the way back to before the first Star Wars movie even released. Over their relationship with Lucasfilm, Marvel adapted all three original Star Wars movies throughout the run of its monthly comic, Dark Horse continued the tradition with adaptations of the prequels, and now that Marvel once again has the licence to Star Wars comics, it’s suddenly less surprising to see a Force Awakens adaptation. But what sets these two series apart — aside from nearly four decades — is the completely different windows they give us into the galaxy far, far away. The Force Awakens comic, by Chuck Wendig with art from Luke Ross and Frank Martin, is about as straight an adaptation you can get. There’s very little narration, and the dialogue is almost entirely ripped straight from the film. Released so long after the movie hit cinemas, the script uses what we saw on screen, rather than the earlier draft we saw in the novelisation. Characters, planets, ships, vistas — they all look just like they did on the big screen. It’s very literal, and in a weird way, somewhat clinical. It’s like watching someone fast-forward through The Force Awakens, except you’re seeing it in a comic book rather than on Blu-ray. The original Star Wars adaptation, however — the first issue of which released in April 1977, a month before the movie released — is anything but. It was, for many people, their gateway into the Star Wars universe before anyone really knew what a game-changing hit it would be. The story of how the Lucasfilm and Marvel Comics deal came about is almost as romanticised as the development of the original Star Wars movie. 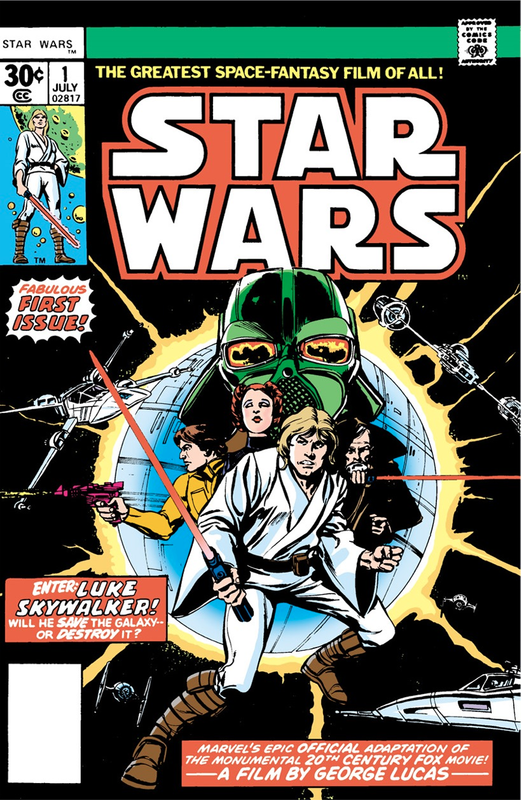 Just as Lucas had shopped around his science-fiction action movie to various studios before settling at 20th Century Fox, the option for a Star Wars comic was floated about at several publishers — including Marvel, who initially rejected the idea as both science fiction comics and licensed comics were selling poorly. With their business in a period of worrying decline, Star Wars was seen as far too risky a venture. Charles Lippincott, Lucas’s publicity supervisor, already conducting an intense preview campaign for Star Wars that saw actors tour the convention circuit to drum up excitement for the movie the year prior to release, repeatedly bugged Marvel to give the film a chance until eventually they relented. Like Star Warsitself, we know the rest of the story: the movie was an unbelievable smash hit, and so was the comic book. Driven by the hype Lippincott’s campaign had whipped up, Star Wars #1, by Roy Thomas, Howard Chaykin, Jim Novak, and Marie Severin, was grabbed as a chance to get an early preview of the film before it arrived in cinemas. It was reprinted time and time again, collected in bundle editions, and sold hundreds of thousands of copies, emboldening Marvel to continue the Star Wars series even after they ran out of movie to adapt. It’s the first issue — of the six that would adapt the film eventually known as A New Hope — that is the most “alien” in comparison to the film. Covering from the opening crawl to Luke being ambushed by the Tusken Raiders, it’s clear that Thomas and Chaykin had limited access to the film beyond the shooting script (and presumably, publicity stills). Not only are scenes that didn’t make it into the final movie included, such as Luke’s encounter with Biggs Darklighter on Tatooine, everything looks slightly off, if still recognisable with the hindsight of seeing the movie. The Star Destroyer from the opening is bizarrely curved, while C-3PO’s body angular and sharp. The X-Wings on the cover are right out of Ralph McQuarrie’s concept art rather than the final design. 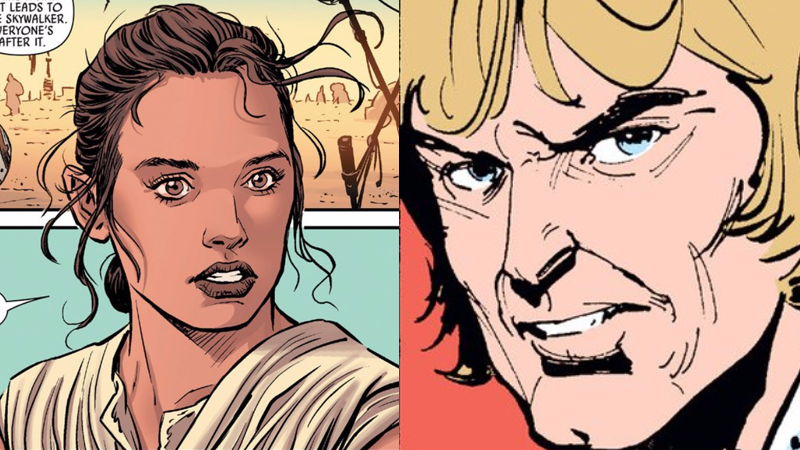 Darth Vader’s visage is almost skeletal compared to its movie counterpart, and... well, take a look at Chaykin’s surprisingly mature Luke, compared to the relatively well-done likeness of Rey in the Force Awakens comic. There’s almost a haziness to it, like someone seeing the movie for the first time and then trying to explain it to someone else. But for many, with a month to go before release, this was what Star Wars looked like. It was a strange, exciting, invigorating step into a wider world. The unfamiliarity of it is still intriguing, all these years later. Most interestingly, by the time the second and third issues roll around, released, Chaykin’s art begins to more closely emulate the movie’s look, with Luke becoming decidedly much younger, and panels recreating shots right from the film becoming more common. But even then, there’s still an alien-ness to the comic. 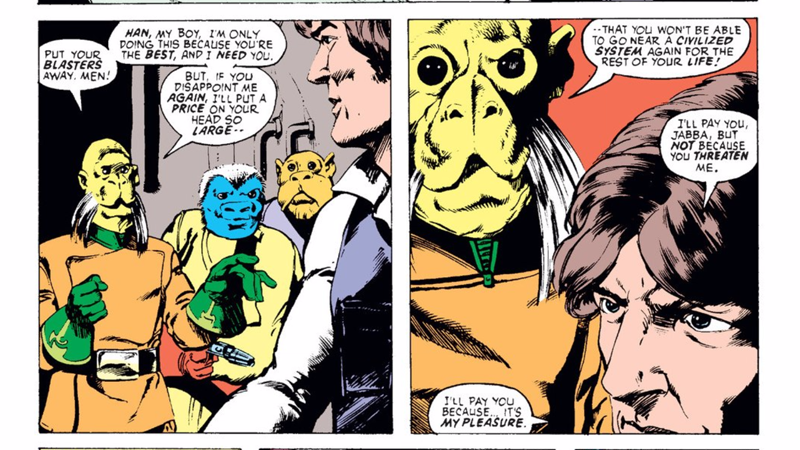 Issue 2, for example, still working off the shooting script, features Han’s encounter with Jabba — except with those scenes cut due to the VFX not being ready, Chaykin was forced to use another cantina alien design for the character instead. 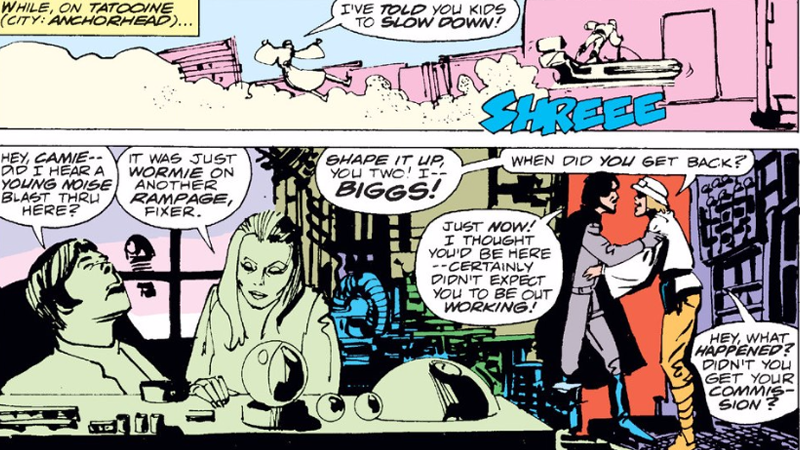 It’s weird little details like this that make the very first Star Wars comics so interesting to revisit, four decades after the fact. Because of the way they were created, before the movie — before anyone really realised, beyond a select circle, just how special and monumental Star Wars would be — it’s a unique insight into a world millions of people are familiar with, and have experienced time and time again in decades since.